Sticks and Bones started as an acoustic duo and has performed as several different lineups, from acoustic duo to 4 piece electric band. We have a full P.A. system that can accommodate most venues. More detailed information about band configurations here. Friends since Middle School, the guys have played in bands together off and on over the years. Prior to Sticks and Bones, Dayton and Bart played in Mean Season. Juan, and Sam all did stints playing bass in Mean Season. Prior to joining Sticks and Bones, Juan played in Jerico. Given their long history and friendship, the guys in Sticks and Bones have a great bond that translates into a great band chemistry. 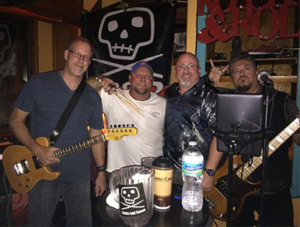 Sticks and Bones performs as a 4 piece, 3 piece, and sometimes as an acoustic duo playing classic and modern rock favorites.